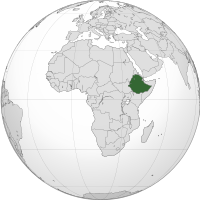 Sigelhearƿenaland oþþe Æthiopia is land in Ēastaffrica in þæm dǣl se hēt Affrican Horn. Þis rīce hæfþ Æriþrea be norþēasten, Cgjibūti be ēasten and ēac Somālia be ēasten. Sudan and Sūþsudan licgaþ be ƿesten and Cenia be sūþen. His oneardendas sind 93,000,000 and Sigelhearƿan sind þas ƿoruldes mǣsta landþēod mid landbelūcum rīce, and in Affrican his mǣsta rīcesþēod būtan Nigeriaþēod. Þæt land hæfþ 420,000 mīla þæs feoƿerscyte, and his hēafodstōl and mæste burg is Addis Ababa. Æthiopia secgaþ ƿitan is ān on þæm ieldstan stede þærin stōd manncynn and hie hycgaþ þe of þissum fōr manncynn Homo sapiens ūt on Asie and in land þærofer. On Sigelhearƿum sind manigum gereordas and ymbe 80 mægþu, þærof sind Oromo folc and Amhara folc mæst. Þæs landfolces stæfræƿ, se het Ge'ez oþþe Æthiopisc, is one of the oldest alphabets still in use in the world. Se mæsta dæl þisses folc sind Cristen ac þridde dæl is Mahometisc. Micel flocc of Iudeas, þa geafon him þone naman Beta Israel (se is Israhēlhūs, oneardoden on Sigelhearwum oð 1980s þa gearas ac hie habbaþ geleorden on Israhēl. Man nīwanost wende þisne tramet on þǣre 13:21 tīde þæs 13 Sēremōnaþ 2018.